The reliability of bearings has a profound impact on wind turbine operating costs. But as the parts are often subjected to a wide variety of operating conditions, they may fail when they are pushed beyond their limits. In fact, in the past, as many as 80 percent of wind gearbox failures were caused by faulty bearings. Here are the top four main failure modes. 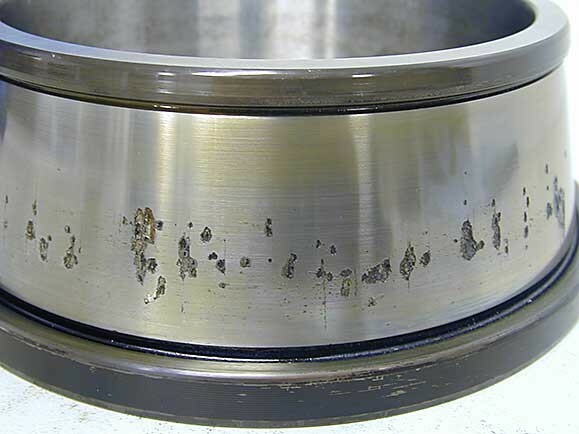 Cracks with white etching decoration, often called white etching cracks (WECs), are one of the most widely discussed premature bearing failures in the wind industry. They can occur at several bearing locations, specifically the planet bearings, the intermediate shaft, and high-speed shaft bearings. In the past few years, many influence factors have been identified that can lead to the development of cracks. Investigations by SKF, for example, have revealed that WECs are a consequence of failure, but not a root cause. A spalled and cracked bearing inner ring. In-depth microstructural post-analysis would reveal white etching cracks as a consequence of premature bearing failure in wind gearboxes. Smearing occurs when two inadequately lubricated surfaces slide against each other, causing material to be transferred from one surface to the other. In addition, the friction can heat the material to such temperatures that rehardening takes place. Both of these effects alter the microstructure of the rollers and raceways, resulting in increased stress and friction, ultimately causing the bearing to fail. Another bearing failure mode caused by inadequate lubrication is surface distress. This commonly occurs in wind turbine gearboxes and affects not just the bearings, but also the gear teeth. The resulting damages impair the bearing function and cause concentrated stresses that can eventually lead to spalling and bearing failure. Corrosion forms when water or corrosive agents reach the inside of the bearing. If the lubricant cannot provide sufficient protection for the steel surface, rust can start to form, damaging the bearing. Free water presents a high risk to the bearing, and it only takes a small amount of water to significantly shorten the service life. While these failure modes and their causes are typical for applications in wind turbines, it is important to note that each premature bearing failure is unique. Failure cases should be reviewed individually in light of the corresponding operating conditions. In the next installment of this two-part series on bearings, we will examine how to protect bearing surfaces – helping boost turbine reliability and performance.